To help teams collaborate we made the viewer free, and it will always be. You only need a license to create versions. Folio detects when more than one person changed a file and prompts you to resolve the conflict while saving everybody's work. Now you can clone existing projects from anywhere, including Gitlab, Github, Bitbucket or your own Git server. 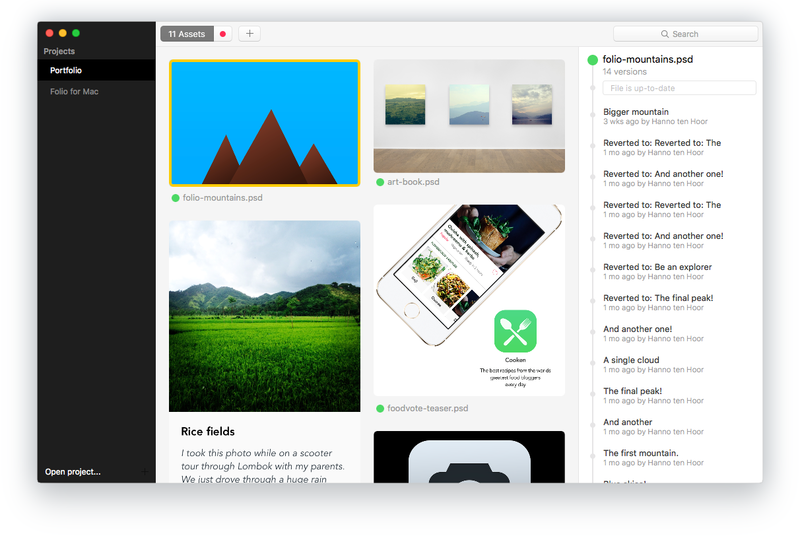 Folio will automatically stay in sync. Gitlab offers unlimited free private projects, including 10 GB free storage per project. Just create an account and publish to Gitlab with one click. Quickly see who changed what and when. Avoid working on outdated files and having to consolidate your changes later. Folio keeps a full history of all versions and allows you to create and restore specific versions with ease. We store previews of all versions, so finding the right version is really fast. Folio supports Adobe Photoshop, Illustrator, Sketch, Antetype & SVG out of the box. And you can add support for most files that have Quicklook previews. Folio’s beautiful visual waterfall display makes great use of your screen real estate. It shows all files in the project (including subdirectories) in one overview. Designers still use shockingly manual and even arcane methods of managing versions. This might be even better than LayerVault.